This school used to be a plastic bottle. This school also used to be an empty chip bag, a coffee cup and a candy wrapper. In fact, it used to be a whole village full of inorganic trash that littered the streets and clogged the rivers. This is a bottle school: a building comprised of thousands of discarded water and soda bottles that have been packed hard with other waste materials to make "eco-bricks." Funded by the non-profit Hug It Forward, there are 30 such schools in Guatemala and El Salvador. And corporate America is realizing the possible benefits of working with such wonderful programs to give back. Hug It Forward began in 2009 with the initial goal to send a hug around the world. However, upon learning of the technology of bottle schools, their objectives quickly transformed from a small project to world-changing venture. Bottle schools are so much more than simply a physical structure built out of waste materials. Their impact is far greater than providing shelter for school children. They bring communities together in solving their problems. Hug It Forward guides the process and funds the basic costs of engineering and building the schools ($6,500 per classroom). However, the community has to manage the project and provide the teachers, and the local Ministry of Education has to agree to provide the salaries. 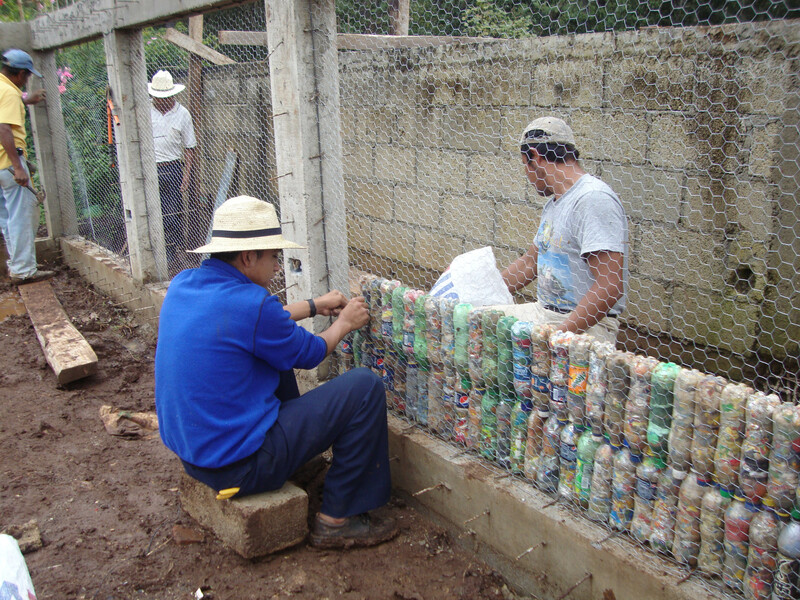 The community members are also responsible for providing the eco-bricks, which means tackling another community problem: trash. Oftentimes, there is plenty of it to go around, as these villages have no waste management system. It takes around 6,500 bottles to build a two-classroom bottle school and the whole community participates, collecting the bottles and packing them full of the other non-biodegradable trash. The final product? A community-built school and a cleaner village. The employees come back changed, and ready to hold their companies to a higher standard. Lush uses the business volunteer retreat to get the employees to learn about each other and to foster employee feelings that are on par with those of the company's mission statements, which in the case of Lush, includes its Charitable Givings program that promotes corporate philanthropy. There was a bond created between those that went on the trip that they now feel even more a part of the Lush family as well as the Hug It Forward team. These staff went back to share and present their trip experience with their teams, which was incredibly inspiring. Having the opportunity to go on a Hug it Forward trip has created an energy in the company, and has motivated staff to get further involved in our Charitable Givings initiatives. Mike Azcue, CEO of WorldVentures, happened upon the opportunity completely accidentally, but has affected the way he runs his company more than he could have imagined. Azcue contacted Balle originally for a web URL he was interested in purchasing from Balle. But a brief conversation about each of their companies soon turned into recurring email contact over a few months. Mike was incredibly interested in the project, eventually asked Zach to come to a WorldVentures event in Dallas to promote the schools. At that event alone, they raised enough money for four schools. 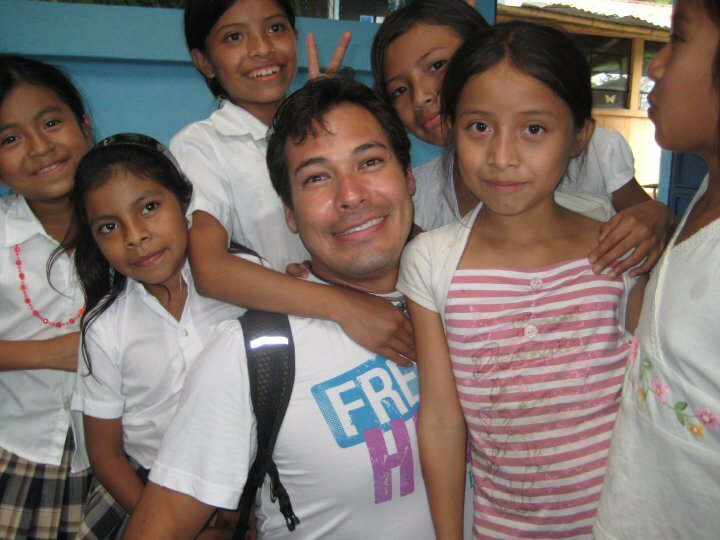 Azcue's former assistant was so affected by the organization's involvement, in fact, that he moved to Guatemala to work for Hug It Forward. United Healthcare did a joint study with VolunteerMatch in 2010 to enquire upon the relationship between employers, volunteering and public health and emotional wellbeing. Eighty-one percent of a pool of employed Americans who volunteer through their place of work felt that volunteering with co-workers "strengthened their relationships," and 76 percent stated that "I feel better about my employer because of their involvement in volunteer activities." But in an even more startling statistic, it found that, when surveyed, 80 percent of Americans who volunteer through an employer described their general life outlook as optimistic, in comparison to 60 percent of non-volunteers. Ninety-six percent of that same pool agreed that volunteering makes people happier, in comparison to 82 percent of their non-volunteering counterparts. However, volunteering isn't just relevant to employee happiness. It also has shown to be directly tied to increasing effectiveness and competency in a number of corporate work roles. The City of London published a study done by Corporate Citizenship, which stated that 93 percent of employed Americans believed that volunteer opportunities offer the opportunity to enhance leadership skills, and over 82 percent believed it develops problem-solving skills, decision-making skills and negotiating skills. Now these are a lot of numbers, but what it could mean for your business is both happier employees and more competent employees. If you aren't simply pulled in by the idea of helping establish international community development and give back, take note of the benefits it could bring. In an era where money is tight, it is hard to imagine an essentials-only budget would have room for employee engagement through volunteer trips. However, Lush executive found a positive correlation between involvement in the volunteer program and involvement within the company, which promotes higher productivity rates and better retention. "We talked about retention with the managers and from what I hear and gather it costs $21,000 to hire a new manager versus under $2,000 (including both airfare and trip costs) to send a manager down here to experience this." Edwards comments. "The end result is everyone gains a greater understanding and connection to Lush". Azcue calls the effect the bottle school experience had on the corporate culture "immeasurable." "It's just something that you feel and I'm certain of it. " He continues: "Our foundation is much broader than Hug It Forward, but Hug It Forward is, in my personal opinion, the biggest part that really drives the heart and emotion of our Foundation." At the current costs of finding and training new hires, corporate volunteering becomes both emotionally and financially economical. With its group voluntour trips, Hug It Forward hopes that each trip will not just end with the plane ride back, but concludes with an affected mindset and more environmental and world consciousness by companies involved. The first time I went to San Diego to spend time with Zach and Josh, I was going to the grocery store to pick up my items and I was getting my plastic bottles of water and, it's funny, because I'm visiting these guys that are all about getting that trash off of the planet and I was contributing to the problem. I had been such a fish in water back in Texas, it didn't occur to me. Starting with myself, I'm way more conscious about the purchases I make. I think it starts with self and we move from there. Also, all the decisions we make as a company, we're asking ourselves - how is this impacting the world and is this the right thing to do? A lot of what we're working towards is not only about the environment, but also our core values to honor, embody and expand trust and to contribute. So, with core values like that we're holding ourselves accountable and having organizations like Hug It Forward to be role models for us in a sense. It's been inspiring for us to watch Hug It Forward, Zach, Josh, and the rest of their team as role models, not necessarily of big business, but thought leaders and people that are thought leaders in quality of life... They've made some really courageous choices in their lives. While many of my peers and I have gone on the journey of empire building and financial rewards, it was really startling to see the efforts of Hug It Forward, but in a good way. We're all looking to achieve happiness, that's what we're all seeking, whether its love or money or that next vacation or more time with your children. Our relationship with Hug It Forward has helped shape the way that we're now looking at WorldVentures and the impact we want to make. So what's your company going to do to make a difference in the world?